Once upon a time, a blustery braggadocious boastful blue bitcmare trotted into Ponyville, only to be ultimately run out of town. However, in those 22 minutes she also trotted herself into the hearts of many a brony and became the most rabidly-obsessed-over mare across all the Internet, second maybe only to Princess Luna. At least, that’s the vibe any regulars to Equestria Daily would get, anyway. Regardless of the precise level of rabid-tude, it’s safe to say that Trixie is a really big deal among bronies, and perhaps even memorable to non-bronies as well. Is it her attitude? Her color scheme? Her wonderfully vague (and thus wonderfully fanficcable) backstory? Who knows, but I’m sure the show staff knew that there was a huge audience absolutely foaming at the mouths for a return of the GREAT AND POWERFUL TRIXIE!! !, and that it was up to them to make it happen one way or another. And thus, on a dark and stormy night, a cloaked figure walks into a trinket shop that just so happens to be holding the most powerful of all known magical charms, the Alicorn Amulet, and usurps ownership of said charm in a deft act of capitalism. Let the pandering begin! The episode begins with Twilight practicing her prowess of magical manipulation on Fluttershy’s animal friends (much to Best Pony’s chagrin) so she can be at her best when delegates from Saddle Arabia come to visit. (Yes, I love the horse puns and no I never want them to stop.) 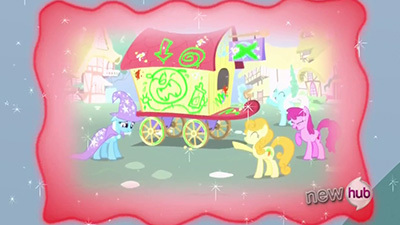 But then who else happens to show up in town but the GREAT AND POWERFUL TRIXIE!! !, who is significantly more aggressive and forward in her displays of magical power than the first time she was in Ponyville: instead of smoke and pinwheel fireworks, she’s mutating limbs and fusing horns and flipping libraries, all in an effort to grab Twilight’s attention. And for what reason? To let Twilight know just how much she humiliated the GREAT AND POWERFUL TRIXIE!!! and nearly ruined her entire life, of course! Oh, and to challenge Twilight to a magic duel, the loser of which is to be banished from Ponyville forever. Twilight, of course, blows off Trixie’s absurd threat (which is not unlike a similarly absurd threat by a pair of blowhards), and while under any other circumstances that would be that, Trixie’s out for blood and the Alicorn Amulet’s corrupting power is going to ensure Trixie gets what Trixie wants. In the end, Twilight is forced to enter into this duel to spare Ponyville and its inhabitants from being turned upside-down and inside-out by a mare run amok. 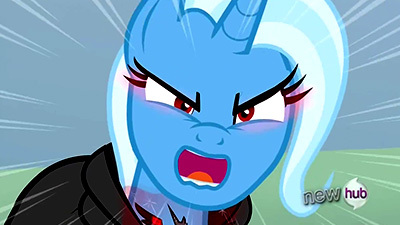 Trixie pulls no metaphorical punches in the duel, resorting to violent spells that have the real possibility of causing significant bodily harm or property damage. Twilight, for her part, does a pretty good job countering her punches in the nick of time, but eventually goes on the offensive and blasts the old braggart with good ol’ Spell #25 and thinks that’s finally that. But THE GREAT AND POWERFUL TRIXIE!!! is not bucking around here and goes right for the clincher: an age spell, a feat of such great difficulty that not even Twilight is able to match. And with that, Trixie literally chucks Twilight out of Ponyville and places a glass dome around the entire village, permanently locking Twilight on the outside. As contrived as the duel may have seemed, I actually kind of appreciate how the victory condition of “perform the highest level spell” went unsaid yet was well-understood by both participants, like it’s an unspoken rule among unicorns that the pony who can cast the highest level spell is the de-facto master. Also, another largely irrelevant but nonetheless keen bit of attention to detail: when Spike and Twilight try to meet claw-to-hoof through the glass, the gap between them is as wide as the apparent thickness of the dome, which it totally should be but could have easily been overlooked by a less astute animation team. Kudos to you guys for getting all these little details right. Now on her own, Twilight tries in vain to get her own version of the age spell to work in hopes of having a chance of matching Trixie’s apparent magical might. Out of ideas and unable to contact the Princess without Spike, she turns to Zecora for guidance. An epic Star Wars training scene later, Twilight is… well, still not ready; she just can’t stop thinking about Trixie (Huh, do you hear that? It sounds like a ship is sailing. No, not just a ship, an entire armada!). Back in DomePonyville, the GREAT AND POWERFUL TRIXIE!!! has used her unstoppable magic to force everypony to do her bidding and decorate the town appropriately for such a narcissistic mare. 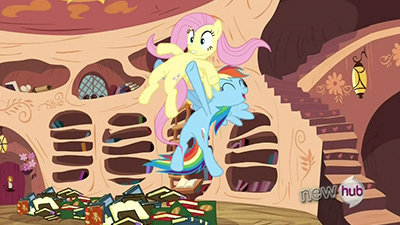 The moment the remaining Mane Six (and Spike) are able to break from Trixie’s slavedriving, they make a beeline for the Royal Oaks Library and scour the shelves for anything that might explain what the hay is going on. As it turns out, the book containing the answer is not hidden behind a previously-unknown secret panel but is instead discovered by Fluttershy, which one could argue is not much different from the book having been hidden behind a secret panel anyway. An amusing whack of the exposition stick (and another supremely adorable FlutterDash moment) later, the team concocts a plan to get a message to Twilight explaining what they discovered about the Alicorn Amulet. Key to the plan? 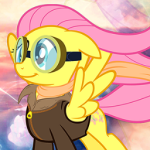 Flutterspy: on an adorable, adorable mission to save Ponyville. 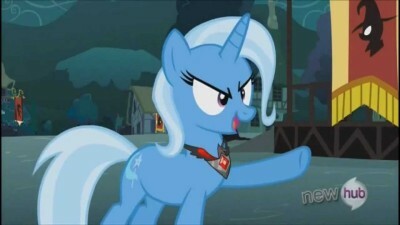 Public Trixie Announcement: THE GREAT AND POWERFUL TRIXIE!!! does not trust wheels. The more you know. Ultimately, Twilight is able to play to Trixie’s greed and corruption by sporting an “amulet from beyond the Everfree Forest” that get her to de-dome Ponyville and agree to another duel. Trixie assumes her age magic is still tops, but then Twilight demonstrates what her awesome amulet can do: rapid-fire AJ/Rarity age manipulation thanks to the AGEINATOR™! Dash-duplication via the Mirror Pool Shot (MPS) [patent pending]! Multi-instrument prowess (no mouth required) with a spritz of Instru-MINTY®! And of course, the R63-CANNON (copyleft)!! Trixie realizes that this amazing amulet’s power exceeds that of the one she’s wearing, so she willingly removes it and grabs the amulet from beyond the Everfree Forest instead… which is precisely what Twilight and company were hoping for, as the Alicorn Amulet can only be removed by the wearer and the amulet from beyond the Everfree Forest was, in fact, just Zecora’s doorstop. Oops. Ponyville once again saved, Twilight heads out to wow the dignitaries from Saddle Arabia and receives some unexpected flashy help from Trixie, who apologizes for what she did. 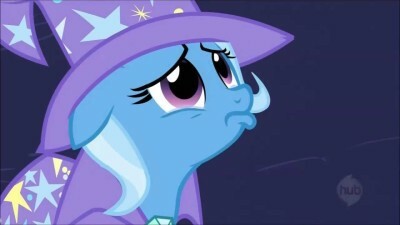 Trixie coming clean and apologizing (and Twilight accepting it) was rather short and abrupt, and while part of me wishes there was more to it, another part of me thinks that’s probably all Twilight really needed to give Trixie: a hesitant “sure” is probably more than Trixie deserved after the chaos she caused. Like I mentioned before, if there was anypony that the entirety of the brony fandom was absolutely dying to see return beyond Luna, it was definitely Trixie. That there really didn’t seem to be much of a moral to this episode (beyond a very generic “rely on your friends” message, which could be applied to nearly any episode just as easily) only further leads me to believe this was a giant bit of pandering to the audience; an excuse to bring back a fan favorite. So from a critical standpoint, this episode didn’t really do much to strengthen any characters or touch on any particularly new lessons about friendship. However, from the standpoint of a long-time fan of the show looking for an enjoyable episode, I’d say this is a pretty solid hit. Maybe not quite a home run, but at least a triple. And for the actual intended audience of the show? A fun little adventure full of visual gags and lots of fun. There’s only one song that springs to mind when I think of this episode, and it’s Return by Omnipony (who no longer has this song on his official YouTube channel, sadly). While the samples are all from Boast Busters, “Return” sounds like something quite appropriate for this episode. As luck would have it, one of my friends took a video of me playing an ITG-ified version of the song on the day this episode aired back in 2013 (my how time flies!). For those interested, this was stage four of WinDEU Loves You: The Redemption, and looks like this when played on a hacked dedicab. Sweet. When I originally heard whisperings that we were going to get an episode about Trixie’s return this season, my reaction (and many others aside from me) was a combination of excitement and a little bit of anxious worry. As has already been stated a few times, Trixie was (and still is) immensely popular after her debut back in Boast Busters, and the fandom went absolutely bonkers creating fan works featuring her. With how vague some of the details about her were, however, this kind of resulted in a lot of variation on interpretations of her character. Was she simply a boastful and egocentric show mare looking for attention who bought in to her own hype and bit off more than she could chew, or was she a completely narcissitic and cruel pony looking to take advantage of others? Was she a complete fraud, her magic merely for show and entertainment, or was she a genuinely powerful mage in her own right who simply couldn’t stack up to Twilight’s talents? Did she take the Ponyville incident on the chin and move on, or did the events there cause her to become obsessed with one-upping Twilight Sparkle and taking her revenge? Basically every possible combination of these variables got play in the fandom, and depictions of Trixie spanned the spectrum. On one end you had her being a misunderstood, sympathetic entertainer trying to compensate for a crippling lack of self-esteem by building herself up as better than she was and incapable of performing magic on any level other than for spectacle, while on the other extreme you had her depicted as a moustache-twirling maniacal villain, only barely behind her rival in power and looking for any chance she could get to enact her revenge, and a massive number of variations in between. Anyways, this was all well and good while we only had Boast Busters to work off of, but bringing Trixie back, while it was definitely something everyone wanted, did mean that a lot of headcanons were going to get torpedoed in the process, as we would wind up with more canon context of who Trixie actually was, and so when we got the news that this was finally happening, everyone who had ever penned or contemplated fanfiction of The Great And Powerful pony (yours truly included) clung to their concepts for dear life, secretly dreading their version of the character wouldn’t make it through the episode (incidentally, something very similar happened to Luna fans back at the beginning of Season 2, although I wasn’t personally caught up in that one like I was with Trixie). The version we got in the episode actually manages to sort of run a middle ground by playing both sides at once. Trixie IS a self-obsessed megalovaniacal megalomaniacal mare bent on revenge, wielding actual magical powers that Twilight can’t match… but she’s under the influence of an artifact that’s giving her the means to use said powers that is causing her to become more and more unhinged and cruel with every spell that she casts, and is genuinely embaressed and apologetic about her actions once she’s no longer under the amulet’s effects. She did try to move on after the incident in Ponyville, but the incident stuck with her and made it impossible for anypony else to take her act seriously. It doesn’t mesh exactly with my ideas about the character prior to this (but then, that’s unreasonable for me or anyone else to expect out of it), but who I figured Trixie to be managed to stay more or less intact with the now-canon version of her. As to the actual episode itself, I like it quite a bit. It’s true that it exists almost solely for the sake of getting Trixie back into the show again and is sort of made for the fans that wanted to see more of her, and so plays out more like a “thwart the big bad” style episode as opposed to one that’s actually trying to carry any kind of moral, but I don’t necessarily see that as a bad thing. I do really like that the means Twilight uses to thwart Trixie by the end are the exact same kind of tactics Trixie herself would have used without her abilities being super-poewred. Also I think this is the first time we’ve actually heard the word “alicorn” spoken in the series. I’ve been trying to organize my thoughts into some form of a reasonable essay, but I’ve got a head full of flu and flu medication and got absolutely zero sleep last night, so bear with me as I just checklist those thoughts. Love the idea of having Trixie return like a Shaw Brothers villain, so bent on revenge that she quickly buys power instead of honing her skills and bettering herself as a magician, thus leading her rival to better herself as a magician. It’s an old trope, but a good one. Love love love that the magic Twilight ultimately uses to triumph is friendship. And not in some mystical way, but actually gathering her friends together for strategic trickery. The CMCs, the Apple Clan. Everyone gets to chip in to the deception. While this is definitely Twilight’s episode, I’m impressed Fluttershy gets a solid arc of her own, going from being so terrified of seeing her animals levitated and unable to speak up loudly enough for everyone to pay attention to her findings, to accepting the mission (in a Rarity-designed spy suit) to be the one to breach the dome and get help. That was a nice twist. Pinkie sans Pie-hole gets so many delightful moments in this, helping to save the day with her one-woman big band routine, and even coming to a surprise defense of her family’s rock farm. Speaking of, I love that Trixie spent a stretch working at Pinkie’s family rock farm. I really like that Trixie isn’t driven out of town in humiliation, instead sticking around and adding some extra pizzazz to Twilight’s display. And that adorable stumble as she runs off. She’s still not the most skilled of magical performers, but it feels like she’s at least on a much better path than she was before. If anyone gets the short end of the stick, it’s Zecora. I really like that she’s a mentor figure for Twilight to turn to, but her lessons come off a bit flat and stock, and she doesn’t fill much more of a role than the typical Magical Ethnic who assists our hero along their path. And I’m still not fond of the arbitrary speaking in rhymes, which does feel forced half the time. So, Pony hooves are solid enough that parts can be bitten off like finger nails, but soft enough that they can be painfully stuck with a pin? Overall, a great episode. Exciting, fun, and not only worthily follows up a past adventure, but does so in a broad way which swirls in many other wonderful elements and angles. What’s an Alicorn? Oh, I hope it’s delicious like popcorn. Or creamed corn, or corn on the cob or… ahem. Yes. Two seasons ago, a tricksy Trixie rolled into Ponyville to put on a show, convince everyone that she was the best there was at what she did, fluff up her ego a bit, earn some coin, and move on to the next town. What she found instead was an actual student of magic who severely outclassed her and a giant bear on a rampage. The townsponies she was trying to fleece She was humbled, humiliated, and fled without acknowledging her defeat. The intervening time, we now know, was spent continuing to flee from her new reputation. Eventually, she gave up on magic entirely to make ends meet. In time, she grew so desperate that she acquired a rare, old, expensive amulet to boost her magical prowess to the point that she could defeat her rival and regain her status. 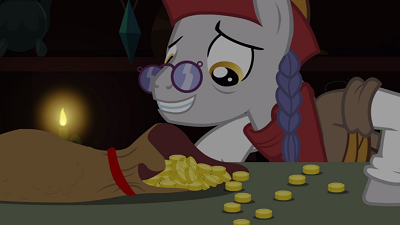 …how did poor unemployable Trixie get the gold for the amulet? Trixie challenges Twilight (what’s that ship called? Trixlight? Twilix?) to a duel, which Twilight promptly loses. Her magical prowess has grown considerably over the last years, with the gravity manipulation, horn lasers, and straight up manipulation of time itself, but even her expanded abilities can’t equal Trixie’s manipulation of time its- wait. No, wait, no hang on. I’m going to guess that Twilight could totally age and de-age things with some practice, but pulling that on her as a unstudied pop quiz was impossible. Training with Zecorah for a full montage wasn’t quite enough to master the spell, but I’ll bet she has it whipped in another week or so. Trixie’s reign is the stuff of evil overlords. Black banners, direct oversight of minions, harsh punishments, illogical methods of transport. She cribbed the entire handbook. Luckily, this gives her classic evil overlord weaknesses: Pride, genre blindness, and overwhelming greed. She ditches her superpower the second she spots an opportunity for an upgrade, but lo! Twilight has taken a page from her own handbook and pulled a switcheroo! The greatest trick of all, however, is Pinkie Pie playing a tuba without a mouth. The second greatest trick was getting that contraption on in less than a second, but I think that can be attributed to Pinkie Pie reality warping. Are the representatives from Saddle Arabia horses? Like, not ponies, but horses? They don’t have cutie marks. Snips and Snails didn’t get reverted, did they. I’m sure they’ll grow up in due time. At least they’ll already know what their cutie marks are. Is it canon that Twilight can restore missing pony parts? Because that’s expert level Photoshop copy/pasting. The last time I saw something like that was in ReBoot. Related: Hexadecimal was the best villain ever.